Pre Order Here! Another die cast entry for Hot Toys and this appears to be an exclusive version...more details on its exclusivity. From what I can tell, there are some slight differences from the previous Iron Man 3: War Machine Mark II. The red outline on the arc reactor is now gone and his eyes are now white, not red. He also bares his Iron Patriot decal on his right arm. The other big difference is the Avenger version comes with a Don Cheadle head, which the Iron Man 3 did not come with. "The much awaited sequel, Marvel’s Avengers: Age of Ultron, will be hitting the theatres very soon! 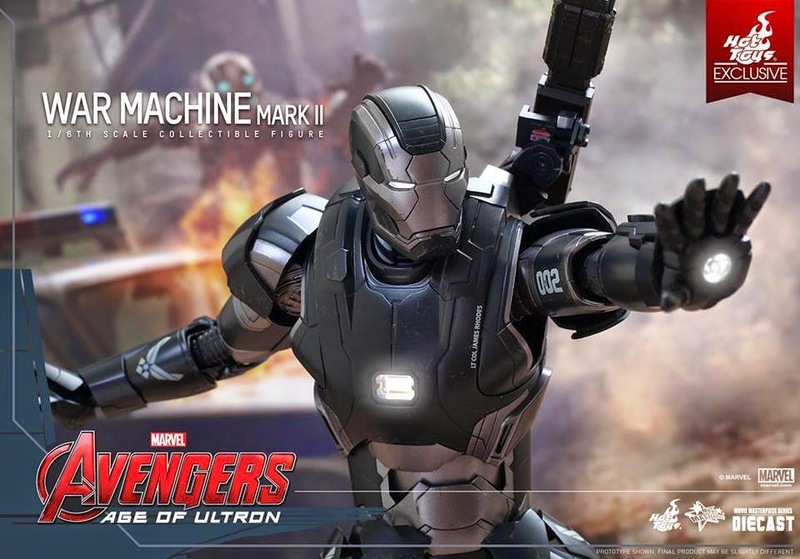 In anticipation of the launch of this epic blockbuster, Hot Toys is excited to present the new 1/6th scale War Machine Mark II Collectible Figure as a Hot Toys Exclusive item! It is also the latest addition to our MMS Diecast Series which the collectible figures are made of diecast material, and realistically designed to look even more like the armor as it appears in the film. For customers in Hong Kong, special arrangement has been made for pre-order. Please visit Hot Toys-Secret Base Facebook Page for more information."